It was a familiar sight on Sunday afternoon in Itajaí, where the two red boats at the top of the Volvo Ocean Race leaderboard set the pace at the start of Leg 8 to Newport, Rhode Island on the east coast of the United States. MAPFRE, in second place overall, led throughout the inshore portion of the leg start, with overall race leader Dongfeng Race Team giving chase just boatlengths behind. Team Brunel and Turn the Tide on Plastic were up amongst the leaders as well, pushing the frontrunners as they headed out to sea for the 5,700 nautical mile leg north. 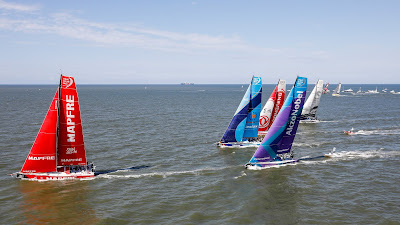 Team AkzoNobel held down fifth place out of Itajaí while Team SHK/Scallywag and Vestas 11th Hour Racing were close to 3-minutes behind the leader at the final inshore gate. The Scallywag team was sporting a new logo on both boat and uniform honouring their lost teammate John Fisher. The forecast is for generally light winds, making for tricky conditions to start Leg 8. The fleet is likely to push out to the east to get further offshore before making a turn to the north. After falling behind Dongfeng Race Team by one point on the leaderboard, MAPFRE skipper Xabi Fernández says his team needs to battle hard to regain the lead. “We need to step up again and use all our strength to try to win this leg,” he said. His counterpart on Dongfeng Race Team, Charles Caudrelier says the leg is complicated with tradewind sailing as well as a fourth and final doldrums crossing for the race. “It’s a nice leg. We have to cross the doldrums again, but it should be in the easy part, further to the west, which is good,” said Caudrelier. Then, it’s the Newport stopover, which is popular with the sailors, as the town is renowned as a sailing mecca. “I love Newport,” said Team Brunel’s Bouwe Bekking. “It’s a sailing destination, with so much heritage with the America’s Cup there for so many years and of course all the locals know what our race is about. 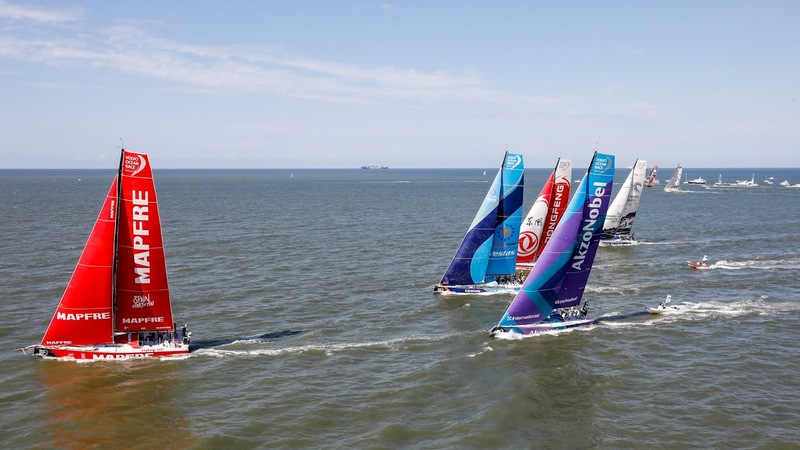 It’s one of the best stopovers.” As the teams left Itajaí, Brazil, they were seen off by a large, enthusiastic crowd dockside as well as a generous spectator fleet on the water for the leg start. Over the course of the Itajaí stopover nearly 450,000 fans visited the Race Village. Fans can follow the race via www.volvooceanrace.com where there is a Race Tracker featuring live position updates for the first 48 hours of the leg followed by 6-hourly updates, as well as the latest news, features, photos, and videos.